Puerto Santiago is a fairly low key holiday resort on the western coast of Tenerife. Being close to both Playa de la Areana and Los Gigantes you are never far from something to do, however the region is quite hilly and therefore the resort of Puerto Santiago may not be ideal for those with mobility issues. A small beach is at the heart of the resort which offers an ideal location to bask in the sunshine on a glorious day. Puerto Santiago is, by Tenerife’s standards, a fairly undeveloped resort but it retains a distinctly Canarian feel with a small harbour and narrow streets for you to explore. As a fishing community there are some great restaurants in the village, most have views over the ocean and as the resort is home to many locals you will find that the prices here offer incredible value for money. Amenity wise Puerto Santiago is not lacking although we do feel that families may be better served in the neighbouring Playa de la Arena which has won has won many awards for its facilities and level of cleanliness and is only a short taxi ride away. One of the joys of this resort is that you can walk along the coast from the harbour over to Los Gigantes and La Gomera taking in the stunning views along the way. It is also an ideal base for exploring the island with Mount Tedie and the mountain region close by and many other top resorts just a short ride away should you wish to take in more of this wonderful islands charm. 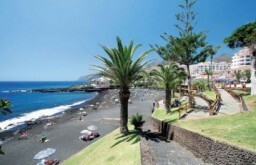 Find cheap holidays and cheap hotels in Puerto Santiago with Tenerife Holidays.